These courses assist employers’ in meeting the current federal and selected state regulations for employee training in General Industry crane use and/or those NOT requiring National Certification. 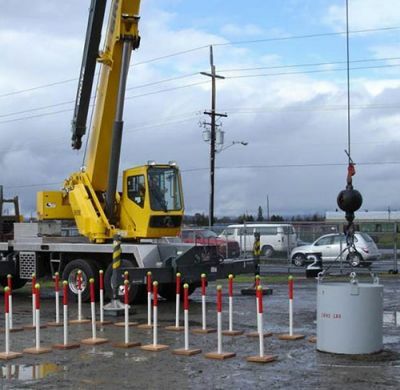 The training curriculum covers pre-operation inspection, basic controls, functions, stability, set-up, outriggers, leveling, cribbing, hazards, wire rope, load hooks, load handling, traveling, load ratings, load weight calculating, calculating lifting solutions and signaling/spotting. Please note: We are not a driving school. The student will need to understand how to operate the equipment before attending our courses. Registration is required. Classes fill up quickly and we cannot always accommodate walk in students. The training schedule is further down this page and can be filtered by location, date, and number of seats available. Clicking on a class will take you to a detailed class description page with online registration. All pricing options are listed within the description after you select a class. Almost all of our open enrollment classes offer registration options for Operator and Train the Trainer students. The student will select their “Student Type” during the online registration process. Buy the same materials our professional instructors use, for in-house use! We author, develop, and produce all of our programs! PLEASE NOTE: These courses will NOT meet the requirements for National Certification of Crane Operators and do NOT include the National Certification Exams. If you require National Certification, please use this NCCCO Schedule link to view the information and schedules for those courses and exams. If you are unsure if you require National Certification, please use this FAQ link to visit our Frequently Asked Questions page.